This photo-expedition is limited to 5 photographers only. The cost of the expedition includes photo shoots and transfer services as per the itinerary, all accommodations, meals as per the itinerary, guides/fixers (subject to locations), a driver and vehicle for transfers from and to the Ahmedabad airport, and land travel in Gujarat. It does not include any expenses of personal nature, laundry or any beverages. The cost of international flights from the USA (or elsewhere) to and from India are not included, and must be arranged so that you arrive in Ahmedabad on the morning of 30 January, 2011. Depending on participants' international flights (arriving/departing to/from Delhi or to/from Mumbai), there are many internal flights to and from Ahmedabad. My Delhi based agent can arrange these for you, as well as hotel accommodations in Delhi or Mumbai. Alternatively, you can arrange these yourself directly. 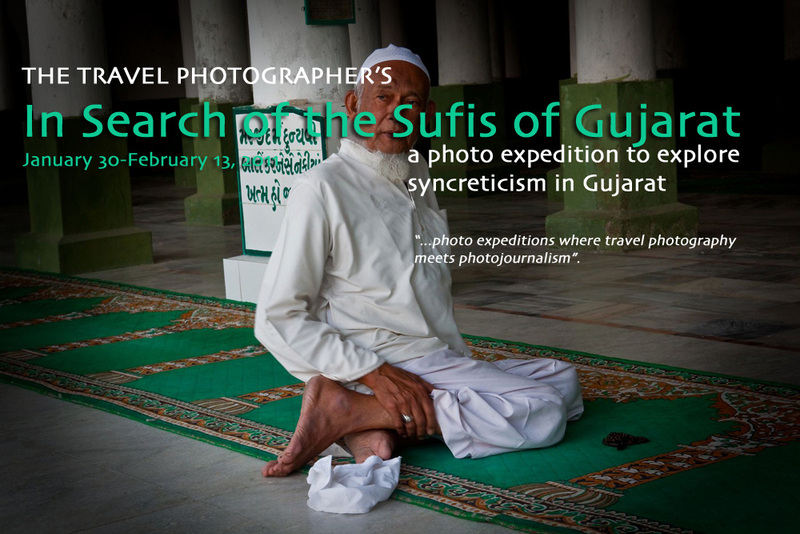 A deposit of $300 is required to secure a place on the In Search of Gujarat's Sufis Photo Expedition. This down payment is fully refundable if notice is given 90 days prior to the departure date. The balance of the cost is due 90 days prior to departure date. This photo expedition is not recommended for first timers to India, nor is it for starting photographers. Our travel agent is based in Delhi, and has arranged a number of photo-expeditions for The Travel Photographer. We shall be staying in a variety of hotels during this photo-expedition. In Ahmedabad, our hotel is one of the best 5-star establishments in the city, while those in South Gujarat are the most comfortable accommodations available in the area. In the Rann of Kutch, we will be staying in Rann Riders; which are delightful cottage-like accommodations, with attached private baths. All accommodations have attached private baths. I assume no responsibility for accidents or injury to individuals participating in the In Search of Gujarat's Sufis Photo Expedition. You will be requested to read, accept and sign an agreement which releases me from any responsibility of liability in the event of any of the situations mentioned below. I cannot assume any liability whatsoever for injury, sickness, damage, death, loss, accident or delay to person or property due to an act of negligence of or default of any travel agent, hotel, carrier, restaurant, company, airline, or person rendering any of the services included in the In Search of Gujarat's Sufis Photo Expedition , or by act of God, act of war or terrorism. Further, no responsibilities are accepted for any damage, changes or delays due to sickness, pilferage, labor disputes, machinery breakdown, quarantine, government restraints, weather or other causes beyond my personal control. No responsibility is accepted for any additional expense, omissions and schedule changes, forced stopovers, rerouting or acts of any governments or authority. I reserve the right to decline or accept any person as a member of any tour or to cancel or alter the tour without notice. It is also the responsibility of the traveler to keep informed on deposit and payment date requirements. It is highly recommended that all individuals obtain adequate travel insurance. West Gujarat, part of its Rann of Kutch and its southern peninsula are the main areas of our exploration on this photo expedition. It will include Ahmedabad, a bustling city founded in 1411 by Sultan Ahmed Shah to serve as the capital of the Gujarat Sultanate, and a repository of Islamic traditions and shrines. As befits the context of this photo expedition, it will be multi-pronged; one will involve photographing tribal life as practiced by the Banjara, the Gowdia and Garacia, the Rabaris and the Jats in western Gujarat, around the town of Bhuj, Dasada and Balaram. Another will involve photographing and document the hijras at the famed Bahucharji temple, while a main objective will be to document the syncretism between Sufi Islam and Hinduism in various shrines and sacred sites in Gujarat's southern peninsula. Many of the Sufi dargahs in the area are also pilgrimage sites for Hindus, thus weaving age-old disparate traditions into one. Another interesting site is the dargah in Mehsana where trances are performed by pilgrims of both persuasions. Another objective will be to document the Sidis; the Sufi descendants of African slaves, who've settled in Gujarat some 800 years ago, and are known as the African Indian Mystics of Gujarat, with distinctive music and rituals. The intellectual context of this photo expedition is not mine. It's inspired by the work of Asim Rafiqui, a US photographer and photojournalist based in Sweden, whose The Idea of India is a fascinating philosophical and visual opus that documents religious and cultural pluralism as a prominent feature of Indian life, and which has been her heritage for centuries. I've led a 10-person strong photo-expedition in January 2010 to the tribal lands of Gujarat, and here's one of the resulting photo galleries Traversing The Kachchh. The Travel Photographer's Photo~Expeditions are best described as a mixture of "documentary photojournalism, ethno-photography and travel photography" adventures. As with other previous expeditions, this two-week long trip will include both documentary-style (candid and on-the-run) photography, as well as posed photo sessions with selected members of the tribal groups we will encounter. The In Search of Gujarat's Sufis Photo Expedition is ideal for photographers interested in documentary photography, ethno-photography and multimedia, and for those ready to create visual projects from their inventory of photographs, and learn how to control story length, intent, pace, use of music and ambient sound, narration, field recordings and interviews. Tewfic El-Sawy is The Travel Photographer, a freelance photographer who specializes in documenting endangered cultures and traditional life ways of Asia, Latin America and Africa, has been organizing and leading photo expeditions since 2000. He's passionate about documentary-travel photography and produces multimedia stories, merging still photography and ambient sound, as well as musical soundtracks. His favorite destination is India, which he visited no less than 16 times. More information is available at WHO IS THE TRAVEL PHOTOGRAPHER? Important Notice: The In Search of Gujarat's Sufis Photo Expedition is limited to 5 photographers only (excluding the leader). It is not for first timers to India, nor for starting photographers. It is for those who seek to document tribal life in Gujarat and are genuinely interested in exploring (and learning) the various layers of syncretism between Sufism and Hinduism. It is also not for the faint of heart as we will be visiting sites that may have rituals that could be disturbing to some. Participation will be subject to a portfolio review. Day 1 + Day 2 Ahmedabad - Sunday January 30- Monday January 31, 2011 We arrive in Ahmedabad and are transferred to our hotel. Over the two days in the city, we will photograph at the Jama Masjid, the Islamic heart of the city and at some of its Sufi darghas, such as Moinuddin Chisti, Hazrat Sher Ali, Piranpir Ki, and Jammashah Dargah. We will also drive to Pirana village for the Pir Imam Shah Bawa dargah, where devotees are chained whilst praying to the saint. If chains fall off, the prayers will be granted. Day 3 Ahmedabad-Bhavnagar Tuesday February 1, 2011 Subject to time available, we continue our photographing in Ahmedabad in the early morning, and then drive (150 kms) to Bhavnagar, and to our Heritage hotel for the night. Day 4 Bhavnagar-Palitana-Bhavnagar Wednesday, February 2, 2011 We will drive to Palitana, one of the largest Jain pilgrimage sites in India, and its 860 temples are considered a most sacred pilgrimage place (tirtha) by the Jain community. It's a steep climb to the top temples (about 3,800 stone steps) but there are porters. It's hoped to photograph the Jains during their pilgrimage, and in their dharmasalas. A full day at Palitana. Day 5-6 Bhavnagar-Diu Thursday-Friday February 3-4,2011 We drive to the south of the peninsula, and reach Diu where we shall stay. During the two days, we will drive from Diu to Jambur, near Sasangir to visit the Sidis. 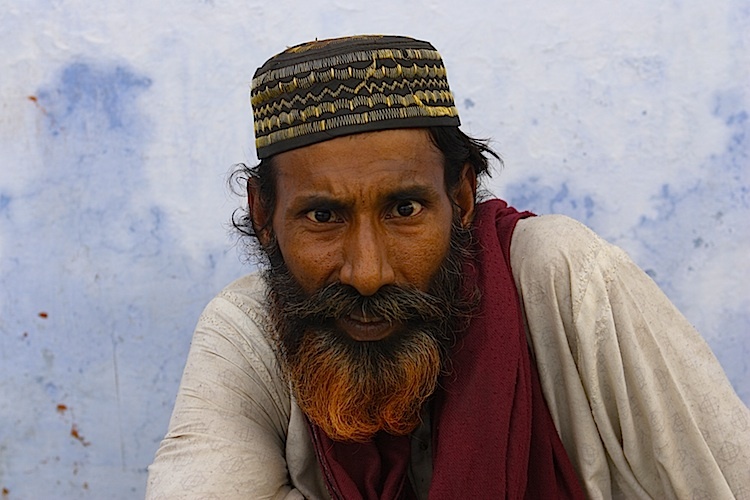 Jambur is several kilometres inland from the Gujarat coastline, and is home to the Sufi Sidis, descendants of African slaves. They worship a local saint known as Nagarchi Baba, or Drum Master, who died over 8 centuries ago. Every evening, Jambur's Sufi drum masters gather at a small mosque, and perform their rituals. Thursday and Friday are Muslim religious days. Day 7 Diu-Junagadh Saturday February 5, 2010 We drive to the center of the peninsula, and reach Junagadh. Our objective is the shrine of Jamil Shah Data Pir, a site sacred to both the Hindu and Muslim communities of the region. The 3500 steps to the shrine (actually a cave) will lead us by the dargahs of Chithria Pir, of Kashmiri Baba, Koel Vir, Hathi Patther, Shakher Mouli and the dargah of Kamal Shah Baba, and finally to Data Pir's meditation cave. Some of these dargahs are mere graves or headstones, while others are more substantial. Many of these saints are considered to have had tantric powers. Day 8 Junagadh-Rajkot Sunday February 6, 2010 We leave Dwarka for Rajkot, further north in the center of the peninsula. Rajkot is the hub for wedding jewelery in India, and its Bangdi Bazaar is a maze of narrow lanes and cul-de-sacs with typical shops selling fabrics and other items, while the bazaar of the Sonis is the traditional community of gold and silver smiths. Interesting photo essays and stories can be developed here. Day 9 Rajkot-Bhuj Monday February 7, 2011 We drive early north-west to Bhuj, the important city in Kachchh district. We hope to arrive in the early afternoon to apply and receive our permit to explore the Kachchh north of Bhuj. Day 10 Bhuj Tuesday February 8, 2011 We will visit various villages in the area is known as a 'Melting Pot of Tribes', where the Meghwal, Samma, Jat, Mutwa, Ahir and Rabari communities co-exist, and will offer endless photo opportunities to add to our ethno-photographic inventory. Day 11 Bhuj-Dasada Wednesday February 9, 2011 We will drive east towards Dasada, perhaps encountering nomadic tribes or salt-makers along the way. Subject to time of our arrival to this delightful oasis, we will travel in open all-terrain vehicles in search of nomadic Vadiara and Kharapat Rabaris of Dasada, known for their embroideries, the silk-weavers colony at Dasada, and Ambala village of the Bharward shepherds and goatherds. Day 12-13 Dasada Thursday-Friday February 10-11, 2011 Over these two full days in Dasada, we will be photographing the shepherd community of the Bharwad (or Ahir Gadarias) tribe, the Padhar and Koli fishing community near Lake Nal, and the wandering Rabaris. We will also drive to Bahucharji temple, and photograph the hijras at the temple itself, and subject to their acceptance, at their dwellings. We plan to photograph at the dargah of Mira Data (or Syed Ali) in Unawa village. It is here that �djinns� can be exorcised by cleansing oneself, and female pilgrims do just that. Part exorcism part trances, we will have to exercise unusual caution and respect at this site. Day 14 Dasada-Gandhi Nagar Saturday February 12, 2011 After an early breakfast, we will drive to Sidhpur, where the erstwhile affluent Bohra Muslim communities have built distinctive havelis (such as the Dawoodi Bohra houses). There's also a temple dedicated to Lord Shiva called the �Rudra Mahalaya� which is worth a stop. We continue to Patan, the centre of Potala silk weaving. Day 15 Gandhi Nagar-Ahmedabad-Flights to Delhi or Mumbai Sunday February 13, 2011 We are transferred to Ahmedabad (32 kilometers) Airport to catch our flights to Mumbai or Delhi, and fly home.